Waterbury Clock Co. "Galway", ca 1883. This is a very large mantle clock that is 36 1/2 inches high. The walnut case has been cleaned, restored where needed, metal polished, movement serviced and is running. 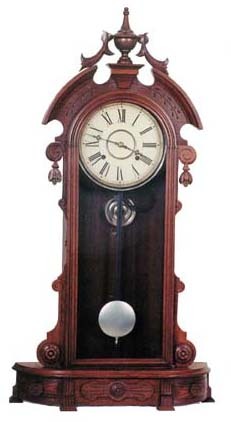 The pendulum, dial,glass, and applied ornaments are all original, correct, and generally enhance the beauty of this unusual clock. 8 day movement, striking a cathedral gong on the hours. Ly-Waterbury No.1542.